Solar Cycle 24 UPDATE - Sunspots begin to rise. WASHINGTON — When the sun sneezes it's Earth that gets sick. cause havoc with satellites and electrical systems here. Oceanic and Atmospheric Administration's space weather prediction center. year and take four to 10 years to recover. lights so bright that people read newspapers by their light. services and other essential functions. when damage occurs, Biesecker said in a briefing. northern and southern lights, high in the sky over polar areas. solar cycle to be the weakest since 1928.
cycle since a peak of 78 daily sunspots in 1928. Measurement of sunspot cycles began in the 1750s. from the sun. At least some of this heads toward the Earth. building up will be number 24 since counting began. 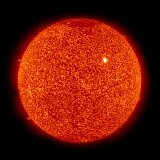 The last solar minimum occurred in December, the researchers said. right now, he said, with only a few sunspots visible since 2007.
cycle, Biesecker said the researchers have now reached consensus.